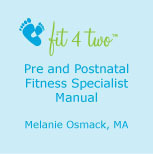 Are you looking for online pre and postnatal fitness specialist (PPFS) training? Visit the Instructor Training section for Fit 4 Two® courses, workshops and more. Shipping Included. Shipping within Canada only. Please contact your local Fit 4 Two franchise to buy direct and save on shipping. Fit 4 Two chooses Rip Cords Resistance bands for all our classes. We love the ergonomic handles and level of resistance that one cannot find in most retail stores. If this is your first band, we recommend RED (medium). You will eventually want to add a BLUE (heavy) band to your collection as some of your larger muscle groups get stronger. Upon purchase, your order will be shipped out via Canada post within business 48 hours. Shipping is included. We ship to Canada only. Fit 4 Two chooses Rip Cords Resistance bands for all our classes. We love the ergonomic handles and level of resistance that one cannot find in most retail stores. Includes shippng (Canada Post) within Canada and the USA. Includes postnatal fitness and nutrition guidelines, monthly goal setting, weekly meal planning and daily fitness/nutrition recrod keeping sheets. This is an PDF. You will receive a link to the pdf file via email after you complete payment. The Fit 4 Two PPFS Manual is used as part of the Fit 4 Two PPFS Certification Course. If you are looking to earn CECs and complete a certification, click here. The manual is included in the fees for both the in-class and on-line version of our PPFS course. Includes shipping (Canada Post) within Canada and the USA.